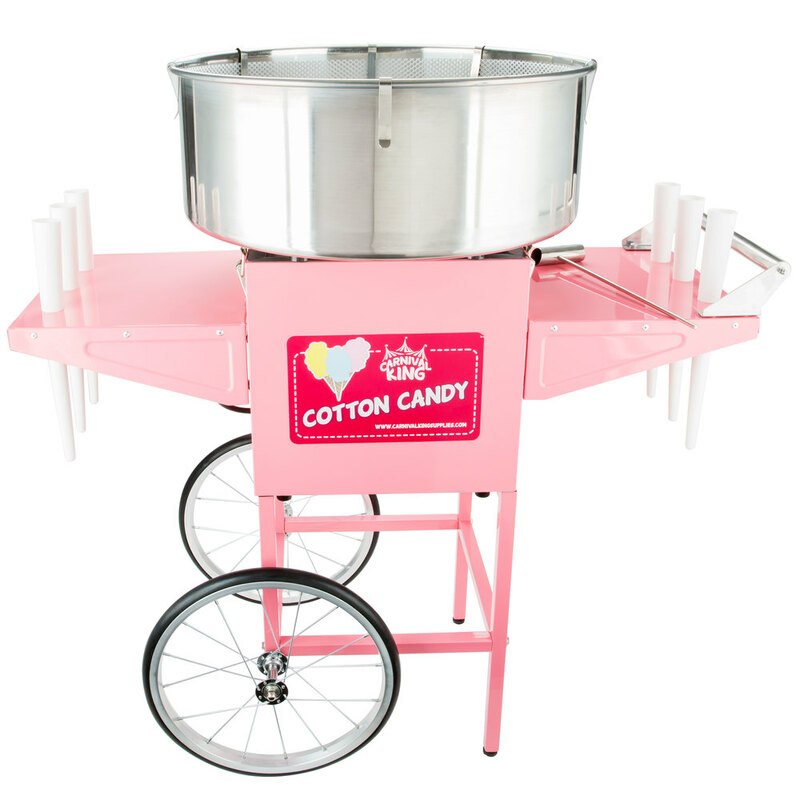 Quickly and effortlessly spin an American classic with this Carnival King CCM21CT cotton candy machine! With a steady production rate of 2 cones per minute, this machine makes it easy for you to keep up with high demand and the increased impulse sales that are sure to come as a result of the included cart assembly. The attractive pink cart has a handy deep well design so the machine sits lower in the cart for easier and more efficient access to product. Each of the side shelves even comes with 3 holes to effectively hold and merchandise fresh cotton candy cones! Using this cotton candy machine couldn't be easier! Simply turn on the power and heat, and within minutes you'll be making delicious cotton candy for your snack stand, carnival, or fairground. A stabilizer net is included to give the floss a highly effective surface to stick to so you can make neat, professional cotton candy cones without any floss escaping the bowl. This unit's reliable belt-driven operation relies on 1050W of power for high volume production and features a large 21" diameter stainless steel bowl to stand tough against the rigors of everyday use. It also comes with clamps that hold down the bowl during use to minimize vibration, making operation smooth and quiet! This cotton candy machine requires a 110V electrical connection for operation.